Claudia studied hotel management at Thames Valley University in London. She then travelled extensively and worked as a freelance journalist. After returning to Portugal, she was trained at Angel Holistic School in Lisbon and has since then been working as a freelance therapist. Studied child care education at Waldorf school in Lisbon and worked as a Steiner teacher in Portugal and Brazil. Created the association “People & Paths“ which offered outdoor pedagogical activities under the topics of ecology, adventure, mystery and art. At that time, she was also working as an art teacher. She is a pioneer of a fairy tale house museum “Casa das Fadas“ which offered puppet theatre and courses about the importance of fairy tales in education. Attended the course “Call of the Wild”(Outdoor education Leadership Foundation Course) at Schumacher College in Devon, England. Today she organizes and promotes walking tours in National Parks in Portugal and continues to work as a forest school teacher. While getting her BA in Biology and Education from Bates College (US), Mirka became intrigued with transformative learning experiences in nature. She went on to study wilderness survival, naturalist knowledge, indigenous culture, and wilderness education at the Wilderness Awareness School, completing the 2-year intensive Anake Outdoor School and Leadership Programs. Following her studies, Mirka travelled and deepened her personal nature connection practice. During a solo survival trip in Northwest Spain, she felt called to return to Portugal, where she lived as a child, to share her knowledge and inspire people to live more nature-connected lifestyles. For the past 5 years, Mirka has been using her skills to offer educational programs and nature-connection experiences for ecoresort guests, school groups, and volunteers at the Quinta do Vale da Lama project, in addition to being a dedicated mom and gardener. She is excited to join the team of facilitators and co-create delicious nature-connection experiences as part of Into The Wild Portugal. Carlos has a passion for bringing people into the wild and discovering the wild within. He is an experienced facilitator of outdoor experiences, including wild camping, wilderness survival, rock and tree climbing, hiking, coasteering, freediving and cave exploration. He worked for over 5 years with the environmental and cave exploring association NECA, leading educational and exploratory journeys on the coast and in the caves of the Arrábida national park in Central Portugal. Currently, he collaborates with the New Discoveries association in the Algarve, offering nature connection and sustainability education programs for all ages. Carlos is excited to join the team of Into the Wild Portugal, to challenge people to overcome fears and limits in their own nature by leading activities to expand sensory awareness and enhance connection with the natural world. Paula Soares : Co-Creator of Academia de Sofia. Paula holds from 2003 a Transdisciplinary Phd on ‘Creative Processes and Levels of Consciousness’ from University of Evora that includes an Appendix describing the Vision of a Futuristic Ecovillage in Alentejo called “Panantropolis”. She graduated as an ‘Ecovillage Design Educator’ certified by Gaia Education in Damanhur, Italy in April 2011 with Kosha Joubert & Macaco Tamerice after attending a Permaculture Design Course at Várzea Viva in Aljezur with Lesley Martin, followed by a “Transition Training Course” with May East in Sintra. After attending a Being with the Spirits of Nature Workshop and the Love, Magic and Miracles Conference in October 2012, she co-created the ‘Academia de Sofia – Laboratory for Evolutionary Development’ at the University of Évora, acting through regular “Academia de Sofia Forums”, inviting, presenting and organically inter-weaving Evolutionary Projects and Themes such as Permaculture, Live with Earth, Tamera Global Campus, Agro-Forestry on one side, as well as through applied Evolutionary Projects developed by Visual Arts and Design Students in Graduation, Post-Graduation, PhD Courses and Short Courses on the other side. In Spring 2017 she proudly accepted to partner with pioneering Into the Wild Portugal in resonance with its core values and mission. Nuno has been a bird watcher from a very young age and is today a marine biologist and ornithologist specialized in seabirds. He worked as as an observer of marine fauna on board ships in the North Atlantic as a specialist in avifauna for environmental impact studies, and for several years he was part of conservation and monitoring projects for birds and the marine environment in Portugal and West Africa. 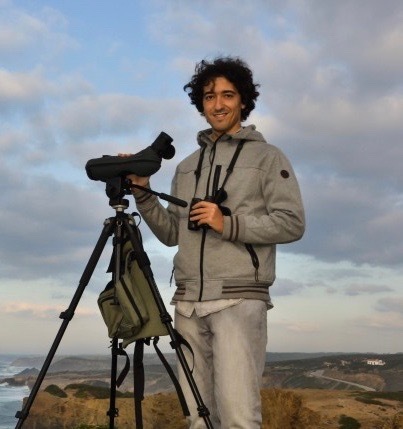 During his conservation career, Nuno has specialized in the study of the impacts of human activity on the sea, monitoring and conservation of seabirds, protected area management and environmental policies. More recently, embracing his roots from Aljezur (Algarve) he created Birdland, a local nature tourism company that interprets the fauna and flora of the Costa Vicentina. Katalina (Katarzyna) has Polish roots and grew up in Calgary, Canada where she completed her first degree in International Business before moving back abroad. While working in both non-profit and private sectors (in education, sustainable agriculture and business) in Spain, Haiti, Peru, Poland and Senegal she also studied and received her certification as an Awakening Coach and Permaculture Designer.